Heroes of the Fray is a deck building card game invented by two kids who originally created it to play with their family but after winning Young Entrepreneur’s Academy in their hometown they were able to create their game and have a kickstarter live to help get their game out to more people. Heroes of the Fray is a game that lets you build an army to protect your hero and duel to the finish. Disclosure: I received a copy of this game in exchange for this post. The idea was hatched when Dabney and William got sick of similar games that were unfair. They created a few versions of their game before getting to this version. You can learn more about them on the website. The top two cards in the photo above are troop cards. There are different kinds of troop cards and each one has three numbers. Red is Attack, Blue is Manna and Green is Life. 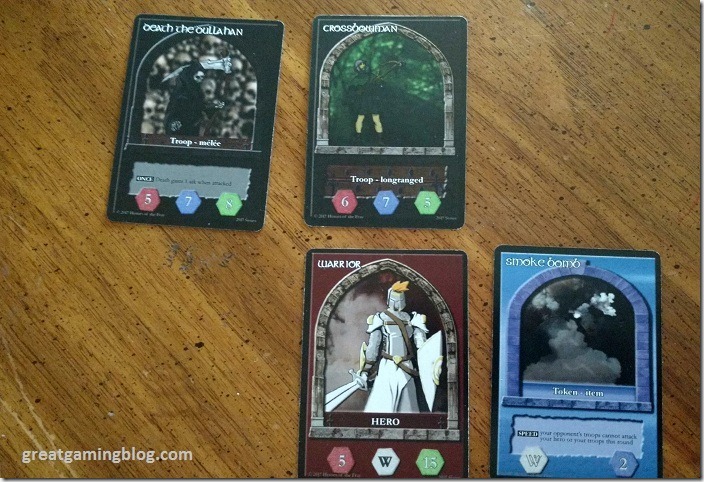 It costs Manna to put out a troop or token card (such as the blue card on the far right). The blue hexagons show you how much manna it costs. Remember your manna is the blue and red cards shown in the first picture. You start with 5 blue an 5 red. Blue manna means you have manna. Red means you don’t. So you start with 5 Manna. If I wanted to put out a card that cost 3 manna, I would turn 3 blues to red. Simple right? When a troop or a hero attacks you do the red # of damage. Heroes can only attack troops and only if there are no troops out on your own. So in the example above I have two troop cards so I can’t attack with my hero. But if they were both gone, I could attack with my hero. The game took a little bit to figure out but is fun once you get the hang of it. 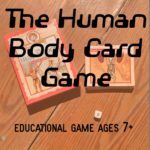 I think it would be a good introduction to these types of card games and I think it’s awesome that it was invented by kids. 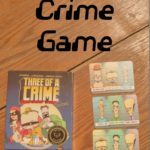 There is no age recommendation from the creators but I would say Ages 8+ just so they can read well enough to read the cards and hopefully have enough patience to figure out the strategy. If you love these types of games consider backing their project on Kickstarter so others can enjoy this game too. I think if I hadn’t been playing a recent game on the XBox with hubby, I would have been totally lost by this concept of a card game LOL. Sounds pretty cool! I love Kickstarter campaigns, this Heroes of the Fray sounds like a lovely game to check out. I am all about adding more games to our game closet here, will have to get this! That game looks really fun! I bet my kids would like it. This looks like a game that my grandsons would really get in to. They love games where there’s strategy and such. I will try to have this on hand for our next get together. 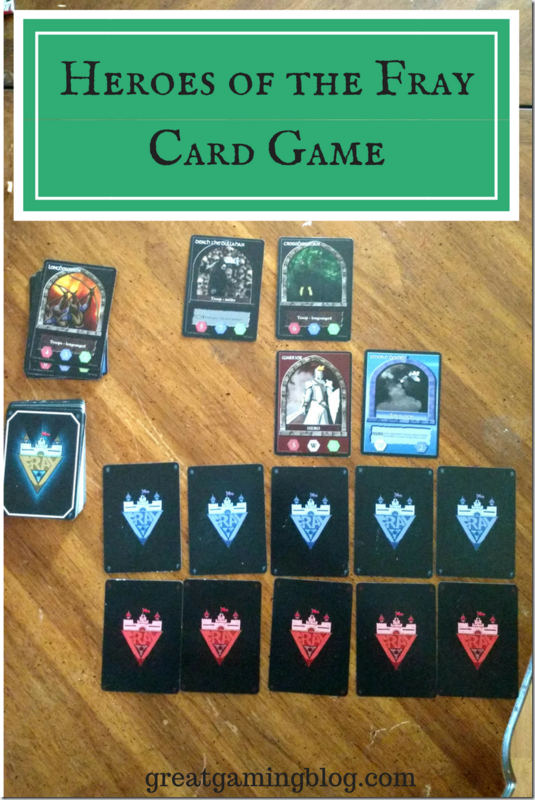 This looks like the type of card game my 11 year old son would flip for! Thanks for the heads up!